What's that on your plate? A boring broiled chicken? An anemic piece of poached salmon? You may not be the best cook in the world, but you know you can do better! All you need to up your dinner game is the From Bland To Grand Cookbook. In it, you'll find dozens of recipes for rich sauces, fresh salsas and bold chutneys-many of which call for garden produce and all guaranteed to liven up your plate. Try topping that grilled pork chop with sweet peach or papaya salsa. Rev up the flavor profile on plain pasta by adding a creamy Bearnaise or mushroom sauce. And don't forget to try apple spice chutney this fall with savory meat dishes. 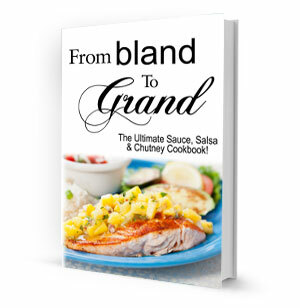 Spice up tonight's meal with a dynamic sauce, salsa or chutney with your copy of From Bland To Grand Cookbook! Dull has no place at the dinner table. The ultimate sauce, salsa & chutney cookbook. Unique flavor combinations with menus suggestions. Never ending variety - recipes for all tastes. Spice up any meal with over 75 dynamic recipes.